Monument Valley is a Navajo Nation tribal park, straddling the border of northeastern Arizona and southeastern Utah of the Colorado Plateau. It preserves the Navajo way of life and some of the most striking and recognizable landscapes of sandstone buttes, mesas and spires in the entire Southwest. The area is entirely within the Navajo Indian Reservation near the small Indian town of Goulding, established in 1923 as a trading post, and now has a comprehensive range of visitor services. There is a hotel in the park called The View, there are also lodging available at the Goulding's Lodge and Trading Post by the entrance to park. National Parks and Golden Eagle Passes are not accepted. This visitor center is one mile east of U.S. highway 163 on the Arizona-Utah border. Hours of the visitor center are identical to those of the monument. The View and The Goulding's Lodge and Trading Post also have rooms. The visitor center has an extensive gift shop one of the largest in the southwest as well as various exhibits of the Navajo Nation, Navajo Code Talkers and the area's history. There is also a full service restaurant for breakfast, lunch and dinner. 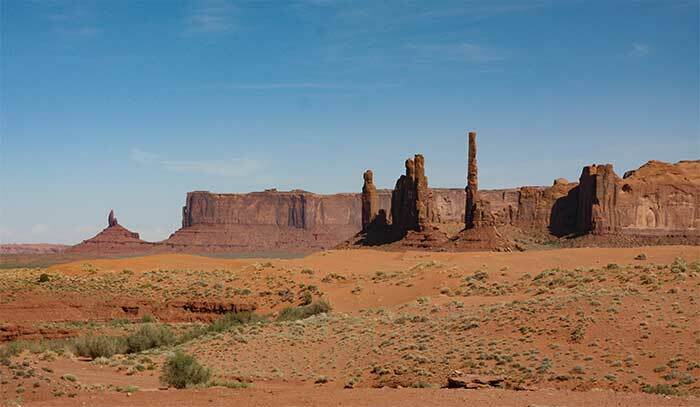 Various tours of Monument Valley, including jeep and horseback, are available by commercial guides. Check at the visitor center for a list and for road conditions. There is a cafeteria in the visitor center that serves drinks and meals. Gasoline and groceries are available outside the park in Goulding. Both the visitor center and Mitten View Campground are equipped with handicap facilities. Campfires are permitted only at designated campsites and fire sites. No open fires are permitted in the campground. Permits are required for camping, hunting, fishing or investigative projects. The Navajo ask prior consent before photographing them or their property.